Manchester Friends of the Earth | Greater Manchester local elections 2019…. will the environment win? 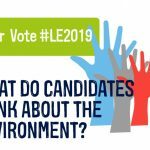 In the run up to the local elections in Greater Manchester on Thursday 2nd May, Manchester Friends of the Earth are asking all candidates standing for election to let voters know what they think about key environmental issues. On May 2nd, people in Greater Manchester have the opportunity to vote for the local councillors to represent them. The local councillors elected will have to implement solutions to meet many social and environmental challenges during the next 5 years and beyond. These include rising transport & energy costs, traffic congestion, illegal levels of air pollution, ill health, low levels of physical activity and the urgent need to drastically reduce climate-wrecking emissions. * Will you support a Climate Emergency motion in your local authority area? * Do you support the introduction of a Clean Air Zone D (which includes private cars) in the Regional Centre? * Will you support re-regulation (otherwise known as London-style public control) of our bus services in Greater Manchester? The responses received so far from each candidate and a summary by political party are available online (2). * Will you support (or have you supported) a Climate Emergency motion in your local authority area? * Do you agree that the Greater Manchester Pension Fund should fully divest from fossil fuels in the next two years? * Do you support the introduction of a zero-carbon standard for all new buildings in Greater Manchester from 2021? * Will you commit to taking Carbon Literacy training within one year of being elected? *. Would you support a ban on pavement parking in your council area? *. Do you support the introduction of a cap on emissions from flights to and from Manchester Airport? *. Do you support (or have you supported) the phase out of pesticide use in your local authority area? *. Do you support the procurement of school milk in plastic-free containers? 2) The local election candidate responses are available online as they come in.